Design your Table to grow with you with column formats from text, to formulas, to lookups, and more! How do I add an Image to a Table? How do I add a calendar to a column? How can I set the default value for a column? Just a heads up, for some column formats, you may be prompted for additional parameters. Column formats in Coda help you customize how data is displayed and expressed in specific columns. In Coda, columns usually represent attributes of things. Column formats help you express the nature of these attributes (e.g. birthdays should be dates) and better display the data (e.g. the image column format will display image urls as actual images). Present information in a useful way: Column formats also display the data (and input options) in more useful ways. 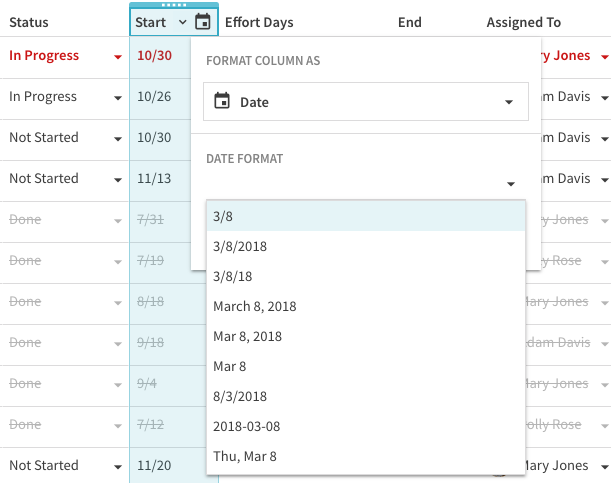 For example, the date column format allows you to configure exactly how you want the date to look and how you want to interact with it. Not to mention the ability to create quick checkboxes and sliders. Percent: numeric data expressed as a percent. Currency: currency; can be further customized as currency, accounting or financial. Date Time: Data with both date and time. People: Used to reference people within your org within a column. 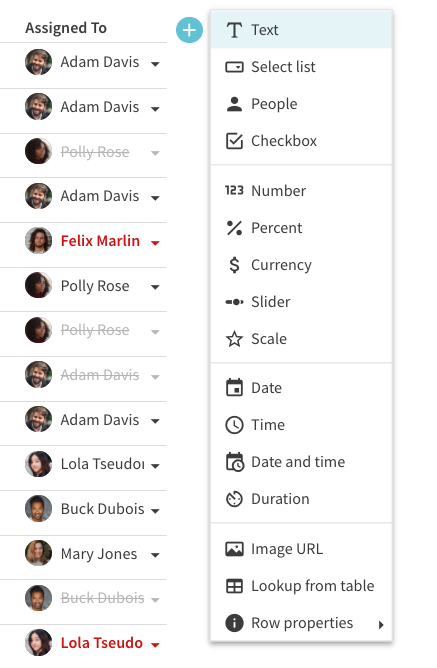 This type of column allows you have a column picker that is automatically populated with the people in your document. In other words, you'll see all individuals who have access to, or have been invited to access, your doc as choices without any fancy programming. You can refer to people in a Coda doc by @ mentioning. One of our most powerful column formats, Lookup from Table allows you to link information from another table to the current table. This is a great way to ensure that information in your doc is consistent across tables and sections. As a heads up to spreadsheet aficionados, our Lookup Column format works a little differently than vlookup. Lookup column formats allow you to reference an entire row from another table. You can then project information from the newly-linked row to other columns in the current table. When you set up your column to Lookup from Table, you'll be asked to select a table within the current Coda doc. You'll be importing row information from this table. To reference a specific row, you'll want to select the display column value of the row you are referencing. After you set up the lookup column, you can then reference data from the looked-up table. To make changes to information in looked-up columns, head to the original table and update the source material. We use this nifty feature all the time for our bug bashes. Start by clicking the column menu and select the Image column format. Now, simply paste the links to the .jpg or .gif of the image, and you'll see them render in your Coda doc. For any column where you want a calendar option, click the column header and choose Date Picker or Date Range Picker. You can also add dates using formulas in your canvas. If you know you'll consistently want the same starting place for your data, you can set the default value for a column from the column format box by clicking on any column and filling in the Default Value space. When you create a new row, the column will automatically pre-populate with this value. The default value can either be a specific value or a formula.